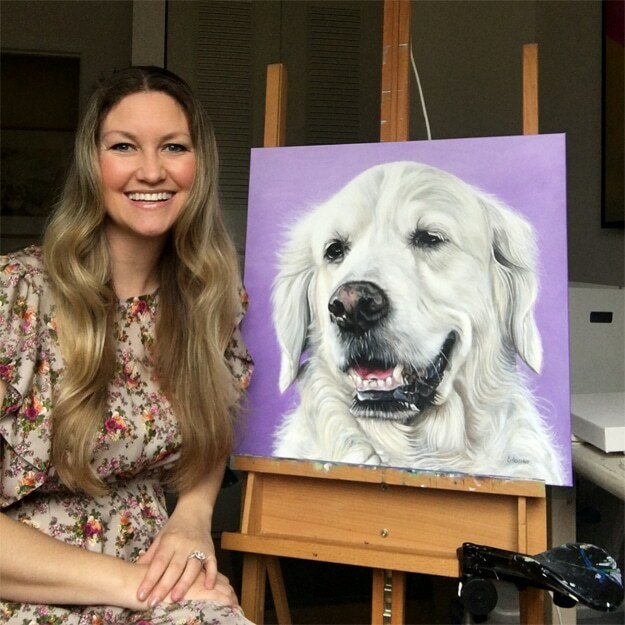 I’m a Swedish-born, Washington D.C.-based painter specializing in pet portraits and bridal bouquet paintings. Since selling my first painting at the age of 10, I’ve had the honor of helping many customers around the world add more meaning, culture and depth to their homes. They trust me to come back for a second (or fifth!) commission within a couple of years. Some say it’s the perfect gift, and many are moved to tears when they unwrap the paintings, or see their loved ones open their thoughtful gift. My process is easy as I work off of your photos to create detailed paintings. We collaborate through out the process and you get to see behind-the-scenes photos as your painting comes alive in my studio. Paintings ship worldwide for free and I offer a 100% satisfaction guarantee. If you’re interested, I’d love to hear from you. Fill out this form and receive a free consultation.